Hi Dan, how are you? Can you elaborate upon a specific topic (or topics) that has become important to you during these encounters, and elaborate as to why and how? I think that important topics for me these days are identity and home. I am confronted with a lot of new people, weather, food, language, transportation, money & currency, relationship, family, artistic notions and methodology, past & present, health, anxiety, manners & politeness, social habits, and much more. Where do I belong, why do I belong there and where does a narrative become or stop being “real” are questions that I ask myself while confronting these topics. Would you please choose two colors for each country, Israel and Germany (or Tel Aviv and Berlin)? These colors should be, as far as you are concerned, very dominant visually and apparent, not symbolic. Can you tell me your associations with them? With Israel my strongest color association is white. Probably because of the Bauhaus architecture in Tel Aviv, the bright atmosphere at the sea side and the presence of the Israeli flags in the townscape. Thinking of Germany in colors I would say something between grey and green, as plenty of cities appear quite grey and the landscape is green. And in addition – a mixture between green and grey brings out something brown, a color that describes the political situation in Germany quite well in my opinion. Could you describe which of your opinions about the German-Israeli relationship has been transformed/changed/modified the most by the encounters project? The “known”, unresolved Israeli-German story still goes on, and keeps on trying to redefine, readjust, re-justify itself. I feel that there’s an urge for new words, a new vocabulary that rethinks the “story” with new identities and new communities. This “new” evokes from a deep understanding of the dynamism of this connection. It needs to be problematized, it has to be politicized. Could you describe a place, moment or object from your encounters that stayed with you? A moment that stayed with me is the first encounter we had in Tel Aviv, encountering a group of people that I basically knew nothing about. From the moment I entered the room in the CCA in Tel Aviv there was a dynamic in the group, which developed from the first minute and has since then stayed very present for me. The dynamics of the encounter constantly changed: Sometimes fast, slow, complicated or simple dynamics but there was definitely no standstill. They became more and more complex, sometimes even confusing or irritating but they were always impelling my working process. I am very much looking forward to seeing how they will develop until our last meeting and I am sure that they will also stay with me after the encounters have finished. Could you identify a moment in the encounter that for you was unexpected or surprising and explain why you experienced it in that way? somehow, when i think of a surprising moment, i think of sound. i can recall 2 moments of unexpected sound during the enCOUNTERs time. the first was in Frankfurt am Main, when, as it seemed, a boat was baptised in the river. it started with the sounds of gun shots and continued with fireworks. the second ‘surprising’ sound moment was during one of our afternoons in the uferstudios (wedding/berlin) and it was the sound of police sirens, followed by an explosion. in the first i thought of an arabic wedding, and the immediate connotation of the second was of the bomb disposal of a ‘suspicious object’ (חפץ חשוד). sounds that for a moment managed to jump through time, space and culture and both remind me and make me forget where i was. can you say something about what a healing process is and whether it is possible in any way? Wounds heal. The cut skin, the torn muscle, the broken bone heal. Healing is life not ending, but connecting with itself, closing the wound that was inflicted. Healing is the flesh that wants to live: this is the soul: life not wanting to end. Souls cannot heal, for they cannot be wounded, they are the healing of the flesh themselves. The flesh is healing, but it cannot be healed. Never trust a healer. There is no healing the flesh or the soul, there is no healing the past or the future. There is no healing someone, there is only curing, but a wound is not a sickness. Words cannot heal, they can only cut. Trust me. Healing is the flesh writing its own history: this is the soul: time overcoming itself. Healing is trying to forget the wound. There is a word for that I forgot. Life is not itself. Identity is sickness posing as the cure. There are no healers, there are only curators. Curating is identifying. The curated flesh may heal or it might not. There is no cure for life beyond killing. Death is the wound that never heals. Design might promote itself as being oriented towards a happy user. I however believe design is nowadays much more about systematic serial production. Raw materials going through a process of (often irreversible) transformation into x identical units – same function, same shape, same texture, same taste. Sand-cast aluminium, injection-moulded PVC, poured clay, stamped cardboard, extruded boiled-eggs. And yes – maybe we are too concerned with designing nations. Pushing ourselves through extruders, pouring others into moulds. Excited to open the package and encounter what we have expected (and paid for). No errors, no surprise. Please take a moment to complete the consumer satisfaction survey. Yeah, sure. So, as I am not interested in instant meals and bored of ready-to-use commodities, I don’t buy designed nations. PS: Check crafti(vi)sm and rapid-prototypism as emerging design movements. I am cynical, but they might do good to your nation. To fail is a very ambivalent notion, charged, often negatively, but not necessarily. It depends on the purpose to be achieved; to fail is always relational to expectations. Thus, to stress the “count” I read (etymologically incorrectly) in “encounter”: It depends on what counts in an encounter, if and how it can fail (or succeed, but you didn’t ask about that). Further, to reach the potential to fail, the encounter must actually already have started; only then it can take a course towards failure. Two (or more) sides, others to each other, must have met, countering each other or, as the verb “to encounter” also means: meet unexpectedly. That is, meet open for the “in” in “incounter.” If the unexpected in an encounter – that which was or is not counted on beforehand, before encountering the other – does come to an end (or was never there), it will start to fail, with only the expected left in the room, and end being an encounter. Count the unexpected in. What is a creature, and what is special about encountering creatures? A creature can be everything that exists on this planet. I like to see people and myself as creatures because like that I can identify human beings as a part of everything that exists (as another animal) and in that way I can observe its behaviour, rules and stories as a researcher from the outside. As a child I could not stop drawing creatures, they were always there with me and they changed over time. They give me an entrance into my inner world. When I give them life – a physical embodiment – I reflect upon and express the wounded places in me and in what I receive from the society that surrounds me. 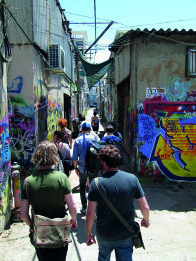 From the experience of the encounters, do you think there is still tension between Israelis and Germans? From the experience of the Encounters? No, I don’t think so. Hm. When you’re asking me to take things with me to an isolated island, you’re asking me to take them out of the existing order as I know it. I’m not so sure I would like to take ‘Israel’ or ‘Deutschland’ to a place like that. I might want to leave them behind. How did you imagine Tel Aviv before you came here? as you have curated this event in a team of two Israeli and two German curators, which important topics came up for you during this collaboration of different cultural/national identities? Please elaborate how and why. Thank you. Well, it’s nice to think of it in retrospect, especially since our initial, almost founding decision was that the en/COUNTERs project would not focus on a common term or topic. We hoped that in this way new topics – ones that are perhaps still not verbalized or even imagined – would grow from the intensive reciprocal process that took place between the artists. But of course, this in itself represents a topic – even if it was introduced as a subject to be avoided, a common reluctance, a negative agreement. In short, I think that the many political and cultural clichés that German-Israeli encounters are entrenched in was one of the main focal points of the group’s thinking. It’s not just the ubiquity of these clichéd and stereotyped representations, or the fact that they are being re-uttered so often, on so many stages. Considering these imagined relations simply introduced a set of interesting questions for ourselves as well as for the artists. We thus were prompted to consider the sources and histories of these relations – both real and mythological; the effects that they have on our perception of national and personal identities; and the different roles that art and artists may have in that process. …does that answer the question?